If you have a car, you’ll find that you need parking spots. This can be a problem, especially in cities with limited space and selection of parking spots. This is why Malaysian drivers can be terrible with their double or triple parking. However, some geniuses have come up with brilliant parking spots which are really amazing. Here are 3 of these amazing parking spots. Do you remember that thrilling Mission Impossible 4 scene where they were fighting in a parking silo? That scene was inspired by Volkswagen’s very own glass car silos in Autostadt. Adjacent to the Volkswagen factory in Wolfsburg, there is a visitor attraction focusing on automobiles. Designed by more than 400 architects, it features a museum, feature pavilions for the principal automobile brands in the Volkswagen Group, a customer centre where customers can pick up new cars, and take a tour through the enormous factory, a guide to the evolution of roads, and cinema in a large sphere. 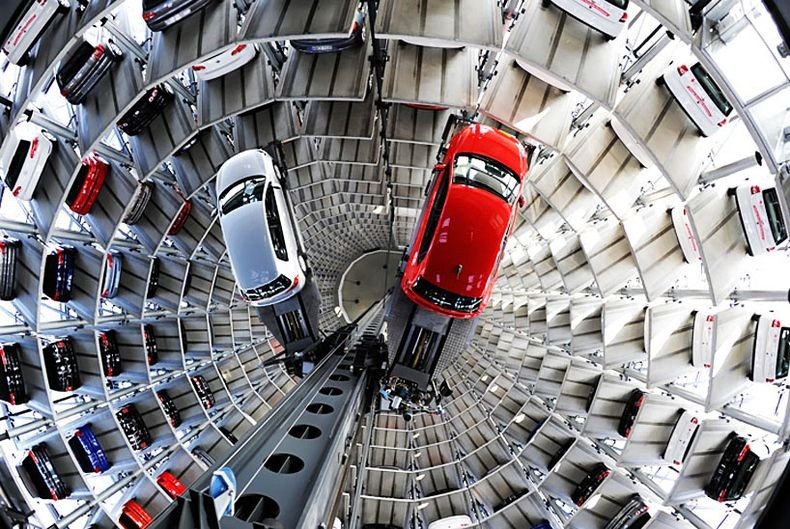 The two 60m tall glass silos, also known as AutoTürme, are used as storage for new Volkswagens before collection by the customer. When new cars arrive, they are carried up at a speed of 1.5m per second to an empty lot, ready for a buyer to collect. When the customer reaches the collection point, he or she can follow on screen as the automatic elevator picks up the selected car in one of the silos. The car is then transported out to the customer without having driven a single meter at all. Driving and eco-friendly has never gone hand in hand together before. But with this parking spot, we’re moving closer to that dream. 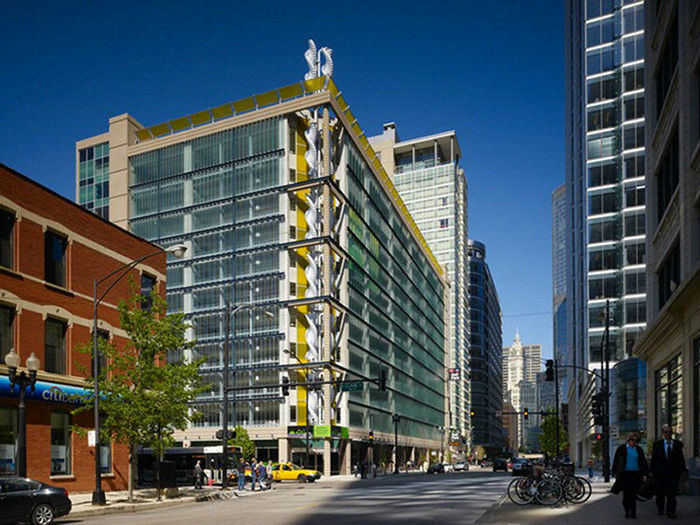 The Green Way Self Park in Chicago makes use of city’s wind to power up the building. The parking garage boasts energy-generating wind turbines, a green roof and rainwater cisterns for irrigation, high-efficiency glass and energy efficient lighting. If you drive an electric car, you not only get to park your car in a well-built parking garage, but you get to charge your car as well, ready for you to drive when you get back. Ah a little something closer to home. Singapore is a really small country, and a major hub. As a city, space is limited, so parking around the HDB flats can get a bit difficult, especially if you have 2-3 cars in your possession. So what do you do? 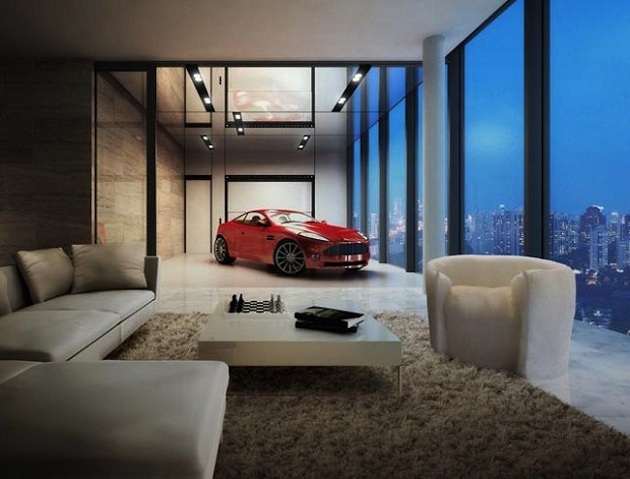 Well, you’d have to be is rich, and you can park your car right in your living room! At the Hamilton Scotts Residences, you drive your car into a biometrically controlled lift, which will bring it to your apartment floor. You have a guaranteed parking spot, and you get to watch over your prized cars as well. How much do you need to own or rent a unit? You can rent it at a reasonable S$13,000 to S$14,0000 a month, or buy your own unit for around S$10,000,000! Cheap! Which ones of these parking spots do you want to try out (if you had the money)? Leave a comment below!